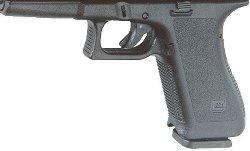 česky | english GLOCK pistol does not change much since it has been developed. The only significant changes are frame modifications. First generation frame had a handle with all-around grip. The second generation had a grip on sides and back only, front part of the handle was roughed. Now, since the third generation frame, the handle is ergonomically formed. Some models are equipped with a tactical rail under the barrel to attach tactical handle, laser marker, headlight etc. The new Gen4 has several new features designed to satisfy the most demanding consumers. It is based on a full size G17/G22 MBS (multiple back strap) frame with a reduced short frame trigger mechanism housing. The multiple back strap system allows the user to change the circumference of the grip to fit their individual hand size. The grip has three options; a short frame version, medium frame or large frame that are easily changed and secured with a single pin. 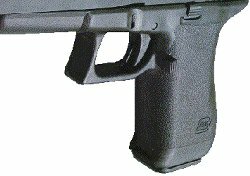 The grip angle of the GLOCK “Safe Action” Pistol is not changed by back strap modifications. This ensures that the shooter does not shoot high or low when modifying the back strap or when shooting with a different GLOCK Pistol.